Make every season sugaring season with our Vermont Maple Caramel! 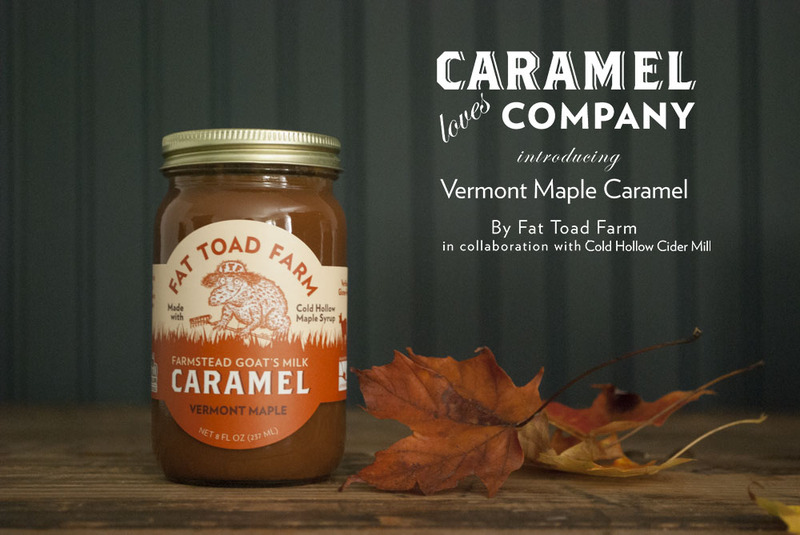 This collaboration brings together Fat Toad Farm and our friends at Cold Hollow Cider Mill! Just as we start seeing the caramel turn a nice golden brown, we stir in Cold Hollow pure Vermont maple syrup and watch as this amber-colored beauty mixes perfectly into our velvety goat’s milk caramel. Trust us, a little (or big!) drizzle on your pancakes, apple tarts and/or pumpkin pies will leave you with a smile on your face and most likely an empty jar! The start of Cold Hollow Cider Mill began in 1974 with Eric and Francine Chittenden, descendants of Vermont’s first governor. They started out as farmers near the base of the Cold Hollow Mountains in rural northwest Vermont. They began making apple cider for friends, with a press that Eric had found. Before long, the couple saw real business potential in making cider the true, traditional way. Fast forward 41 years later and Cold Hollow Cider Mill has become an essential stop on any Vermont vacation to stock up on freshly pressed apple cider, piping hot cider donuts and of course pure Vermont maple syrup!